A visit to the Center is not just an experience, but a journey into the heart of a champion. 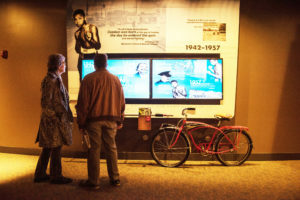 The Center’s two-and-a-half levels of award-winning exhibits and galleries invite visitors to explore Muhammad Ali’s legendary life, as well as to reflect upon one’s own individual values, inner strength, character, and what makes you the greatest person you can be. 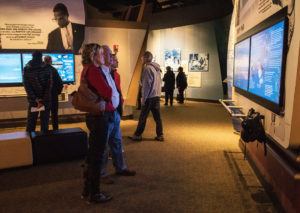 Take a breathtaking journey through the Center’s interactive and multimedia exhibits and discover the six core principles that Muhammad Ali embraced throughout his life and how they gave him the wherewithal to be the best athlete he could be, the strength and courage to stand up for what he believed, and the inspiration to reach people around the world and dedicate himself to helping others. The Muhammad Ali Center welcomes tour groups and motor coaches of 20+ visitors. If you are interested in booking a field trip, please visit our Student Trips page. Complimentary admission for drivers and escorts. Please unload visitors at the Group Entrance near our parking garage. Motor coach parking is free for the duration of your tour. A security officer will assist your driver(s) with parking. Fill out our Group Visit Interest Form. For more information, please contact our Tour Department at 502.992.5340 or education@alicenter.org.